Transposed from a DrexelNOW article published by Beth Ann Downey April 4, 2018. Vue32, the 16-story residential tower and mixed-use development project located at 3201 Race St., is gaining a reputation as stellar as its views. The project, along with the forthcoming Summer12 townhomes being built at 3200 Summer St., has been named the Philadelphia Business Journal’s Deal of the Year for its Best Real Estate Deals of 2017. The publication noted the project’s location, its public-private partnership and the challenges overcome to get it off the ground as major factors toward receiving this distinction. Judges were specifically impressed that a long-term ground lease between Drexel University and Radnor Property Group LLC allowed for budding development activity in University City to make its way up into a residential neighborhood like Powelton Village. David Yeager, founder of Radnor Property Group, said that Vue32 and Summer12 had all the ingredients of a really dynamic project, but it would not have come to fruition without the leadership of President Fry as well as the support of the Drexel community. He added that the Powelton Village community also came to rally around the project, especially after Radnor Property Group worked directly with the Powelton Village Civic Association to address such community concerns as parking and obstructing light to a nearby community garden. “With the support of the community, it wasn’t such a heavy lift because we listened to their needs and feedback,” Yeager said. Brian Edmonds, managing director at SVN|The Concordis Group and one of the judges for the Philadelphia Business Journal’s Best Real Estate Deals of 2017, said that the partnership between a major university and a private company on a real estate venture like this isn’t something he’s seen often — and it can usually be challenging to carry out. “You see them, but you don’t see them all the time and at this scale and complexity,” Edmonds said. Despite this, he added that these partnerships are often great vehicles to get huge projects like this done. Edmonds also believes that the Vue32/Summer12 project showcases a positive move toward and a need for development focus outside of Center City, in communities like Powelton Village. As noted by the Philadelphia Business Journal, no large-scale private real estate investment in University City had been made north of Race Street until Vue32 was proposed. 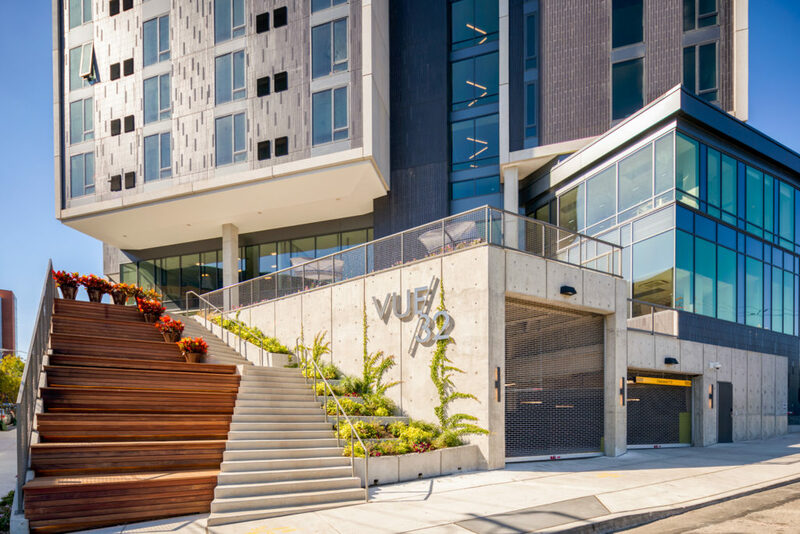 As previously reported in DrexelNow, Vue32 opened its doors to residents in July 2017 with leasing geared toward Drexel professionals and graduate students, as well as non-Drexel professionals. The available apartments are junior one-bedrooms, one-bedroom and two-bedroom residences. All living spaces have nine-foot-tall ceilings and full-height windows overlooking Center City and West Philadelphia. The first two floors of the tower are home to Chesterbrook Academy at Drexel, a preschool leased by Nobel Learning Communities that can accommodate up to 180 children aged 6 weeks to 6 years old. Work on the foundation for the four-story Summer12 townhomes is now underway, and a phased opening of the 12 units, all of which have already been sold, is planned to begin in September 2018. Doreen Trongone-Ciezki, vice president of The Bozzuto Group, which manages Vue32, said the group is proud to be bringing award-winning services to current Vue32 residents. “As the management company dedicated to providing sanctuary and extraordinary experiences for our residents, Bozzuto joins the Philadelphia Business Journal in recognizing this exceptional community for its innovative design, investment in the community and commitment to enhancing life in and around University City,” she said. For additional information, visit www.vue32.com and www.summer12.com.